The Kneed-It targets the physiological causes of pain associated with Repetitive Stress Injuries (RSIs) to the knee for the amateur and professional athlete alike. 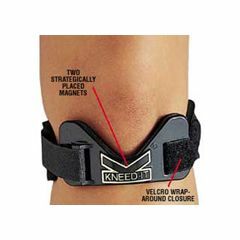 Kneed-It knee guard is an innovative and unique device scientifically designed to assist in the relief of minor knee pain commonly associated with Arthritis, Tendonitis and Chondromalacia by placing gentle pressure along the medial and lateral soft tissues of the knee. It provides pain relief by gently absorbing force at the knee and by exerting concentrated compression and warmth across the soft tissue in front of the knee. Its patented technology is a superior therapy and may be used in conjunction with traditional methods such as taping or wrapping of the knee. Designed by world renowned orthopedic surgeon and sports medicine specialist, Donald Fareed, M.D. As a long time consultant to Olympic athletes, members of the Davis Cup and other professional sports teams, he designed Kneed-It based on 20 years of clinical observation and treatment of RSIs. Now Dr. Fareed brings welcome pain relief where so may people need it, in that most delicate area of the leg, the knee. Dr. Fareed has developed an additional product which is a natural product extension for the Corporation. While the technology is a variation on the KNEED-IT, the objective is the same: to alleviate pain and to prevent injury and reduce the number of surgeries for people with hand, wrist and knee injuries. This product introduces the use of magnetic therapy. "Magna-Therapy", as it often is called, utilizes magnetic pads attached to appendage to aid in the stimulation of blood flow, relief of pain and to enhance natural healing in the areas of the wrist, elbow, knee, and other muscle, tendon and/or ligament areas of the body. Although not yet approved by the U.S. FDA, magnetic therapy is being investigated as a new remedy for many Repetitive Stress Injuries by the National Institute of Health Office of Alternative Medicine. Early feedback on our XM product is impressive and the results are highly successful. Effective. Easy To Use. Lightweight. helps with sciatic nerve . Was hoping my 92 year old mother could use it. But the product can require too many adjustments for her. It also can be annoyingly uncomfortable when inactive. However, when I tested it out, I was quite surprised at how easily I could move with it on. I like the one with the magnets best. It seems to help with my sciatic nerve problems. Good Value. Effective. Easy To Use. Sturdy. Fabulous for Crossfitters with knee issues (tendinitis). Made my squats and wallballs so much tolerable this am! I just used mine for the first time today and I loved it. I also am a massage therapist on my feet all day - so I wore it to work after working out this am and I have not had pain all day. It is a fabulous product. Easy To Use. Effective. Good Value. Sturdy. This product is very effective in relieving knee pain. Shortly after applying these knee bands, I could feel the effects. As the day progressed, there was virtually no pain in either knee. The results lasted long into the night after I had removed the bands. This is a great product.... I highly recommend it! Love this product, would purchase again. Effective. Sturdy. Lightweight. Stays in place. Had left hip replaced in Aug. , but left knee has arthritis. I put this on for added stability and to exercise on stationary bike. It feels great, stays in place and Helps my knee feel much better. I was skeptical , but ordered and am impressed with product. Thought I'd give this a try and was pleasantly surprised that it relieved my knee pain. Thinking about getting another for other knee. Would this help the pain from swelling in my knee from venous insufficiency/lymphodema? Wuuld this be useful for knee pain due to swelling from venous insufficiency?